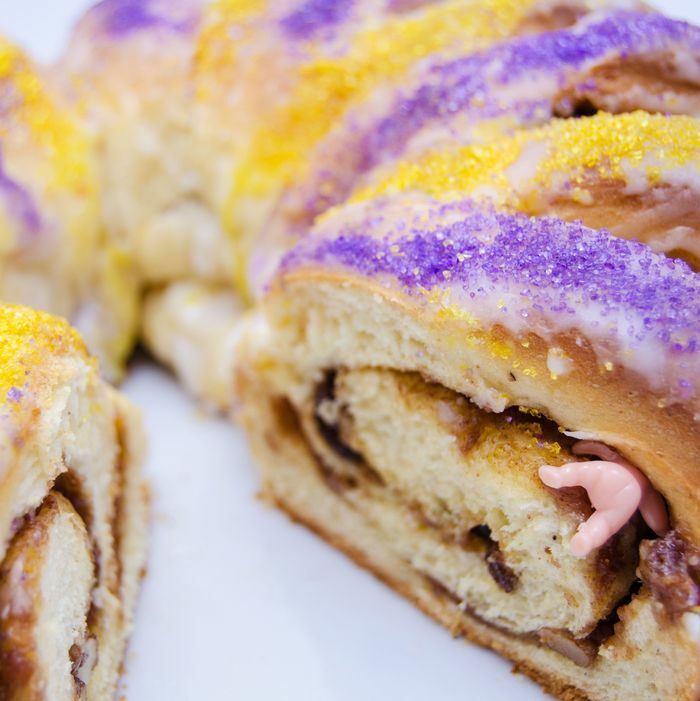 Tomorrow is the Epiphany, a feast day that for Christians marks the big reveal of baby Jesus, but for everyone else there’s also the seasonal appearance of king cake. For Americans, king cake is mostly the Louisiana-style pastry ring blanketed in purple, green, and gold sugar like the one seen here — there’s no resemblance to galette des rois, the original French almond puff pastry — but one tradition shared by both is baking in a trinket for the “king” to discover by unwittingly biting down on it. This practice, meant to be an auspicious sign, unsurprisingly goes well with another American tradition: suing people. So it seems that rather than face angry customers with tooth aches or choked children, bakeries are deciding to simply stop including the prizes. The tradition actually began with a hardened fava bean, but the surprise has grown more elaborate over the years. While Le Pain Quotidien says far too many customers have sued after biting into salads with olive pits for the chain to even consider the idea of ceramic baby Jesuses (it’s opting for chocolate-covered almonds instead), François Payard bakeries this year will bury whole magnets shaped like Le Creuset cookware in the folds of its galettes des rois. It apparently has confidence in its clientele, saying, “All of our customers know there is a charm hidden inside.” There’s a set of printed instructions included with each cake just in case, anyway.